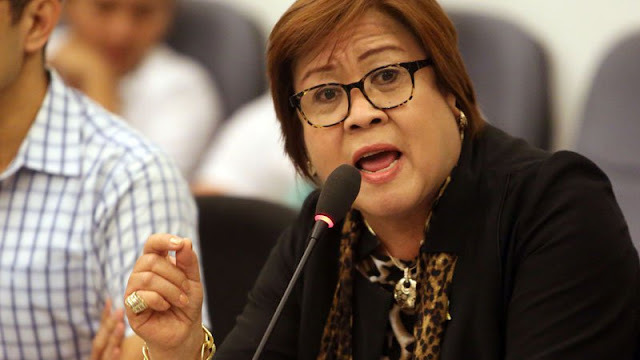 De Lima, in a round-table interview with Inquirer editors and reporters on Monday, said that she would file a petition for a temporary restraining order at the Supreme Court to stop the burial of the deposed dictator in September. “The best option at the moment is legal. Resort to the Supreme Court,” “We will ask for a temporary restraining order, it will be a petition for prohibition.” said De Lima. The senator said that she might file a separate petition or join other petitioners who oppose the move, such as her fellow Senator Risa Hontiveros. “What I know is several groups will be filing [petitions]. In fact, I want to be a co-petitioner. I am still mulling over whether I will have my own separate petition or together with some like-minded senators like Sen. Risa [Hontiveros] or just co-petitioner to any petition filed by other groups,” she said. De Lima said that they are in the process of developing legal arguments and theories to support their petition. The former secretary of justice and human rights chairperson explained that while there is no law prohibiting the burial of the former President at the heroes’ cemetery, the state is not compelled to accept all those who are on the list of persons who are allowed to be buried at the Libingan. “There is no law specifically prohibiting the burial. But the law which tries to enumerate those who can be buried at the Libingan does not really mandate or compel the state to accept any and all those who belong in the enumeration to be buried there,” De Lima said. “It allows but it does not mandate. There is difference from authorizing [or] allowing, from mandating,” she said. The Armed Forces Regulation 161-375 provides who may be buried at the Libingan. The list includes Medal of Valor awardees; secretaries of National Defense; Commanders-in-chief of the Armed Forces of the Philippines; veterans of the Philippine Revolution, World Wars I and II and recognized guerillas; and former Presidents, widows of former Presidents, national artists, and statesmen.